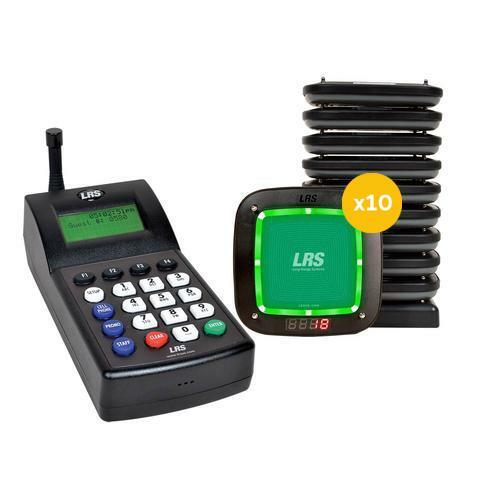 The LRS Connect paging system includes 10 Guest Pager Pro's and an LRS Connect internet-ready transmitter. Includes your choice of up to 60 pagers. With an LRS Connect paging system, choose to text message customers on their phone or notify customers via a pager. Integrate with other software tools like wait list applications or point-of-sale systems, and measure wait time data and analyse trends. Includes: (10) LRS Guest Pager Pro pagers numbered 1-15 (RX-CS7), (1) LRS Connect Transmitter (TX-7470), (1) Charging Base (CH-R8-15), (2) Power Supplies.